Bolling Green | SoHo Memory Project. Remember those fabulous welded metal sculptures that used to live on that triangular piece of land where Broome and Watts came together, over near where the old Film Forum used to be? People called it Bobby Bolles Park, though it didn't officially have a name. I don't even think it was considered a park before the sculptures arrived. 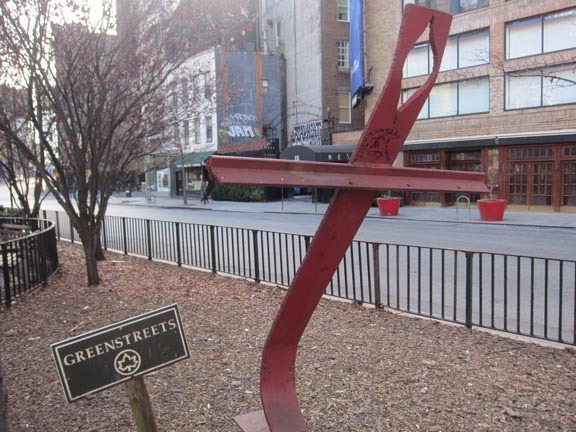 A sculptor named Bob Bolles, a diminutive man in jeans and a red scarf who was a regular fixture at the Broome Street Bar, installed his work at this location in the 1960's, without permission from the City or Parks Department, but nobody seemed to mind. In fact, the sculptures made an otherwise unremarkable intersection on the way to and from the Holland Tunnel quite interesting. The rusted metal forms rose out of the street. Children (and probably some adults too) climbed on them, garbage from twirling trash cyclones got caught under them. The sculptures thus remained, until one day at around the turn of the millennium when the Parks Department decided that we needed a park there as part of their Greenstreets program. It is true that SoHo has very little green space. In fact, maybe none at all. Nevertheless, I question the integrity of the decision to remove the sculptures and put them in storage at the Parks Department's facility on Randall's Island after stipulating in the plan for the new park that the sculptures would remain. There were arguments made on both sides. The sculptures are part of SoHo's artistic heritage. They are grandfathered in place because they predate the NYC Arts Commission. They are an official historic landmark. We didn't ask for a bushy park. Countered by, they are an eyesore. They are too expensive to maintain and insure. They were but there illegally. They are "trash magnets." After a long battle with the Parks Department, MacPherson and the SoHo Arts Council he founded were able to return three of Bolles' sculptures to their original home in late 2005 and are hoping to bring more of the sculptures back and to re-rename the plot Bob Bolles Park. But the sculptures now look out of place, like interlopers in someone's somewhat twisted idea of urban beautification. The park is now officially called Sunflower Park and is surrounded by tall shrubbery, giving people (men) ample cover in the spring and summer months for public urination. From trash magnet to pee magnet. We've come a long way, Bobby!